John Goggin and Catherine McNamara were married 22 October 1823, she was approximately 10 years his senior. The Limerick Chronicle article reported that the marriage took place “On Monday morning, at Kilmurry Church, by the Rev. Henry I. INGRAM, Mr. John GOGGIN, to Miss M’NEMARA, of George’s Street.” The couple would go on to have at least two children of which we know, daughters Catherine (C.1837-1848) and Julia Maximelia. John Goggin worked as a Confectioner and Caterer on George Street (O’Connell Street) from at least 1824 until his death in 1863, the confectionery shop had initially been owned by his wife before their marriage. 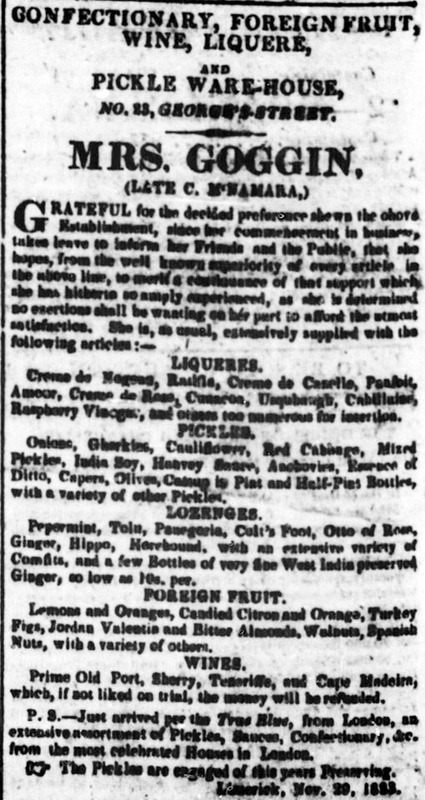 In November 1823 a list of items for sale in the Goggin shop was placed in the Limerick Chronicle. 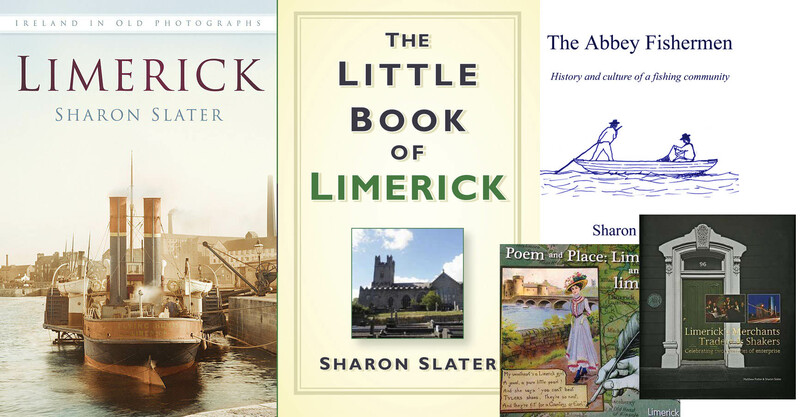 The shop was noted in the city’s trade directories from 1824-1856. The couple and their children lived their quietly until 1846, when the number of poor affected by the famine were so great on the streets of Limerick that John Goggin had to hire security patrol outside and protect his store. (Limerick Examiner). In 1848 tragedy struck the family. Their youngest daughter, Kate (Catherine), died in November at the age of 11. A few weeks later in December 1848, John’s shop assistant, Bessie Pardy, also died at the aged only 14, she was referred to as an “interesting girl” and the sister of Constable Pardy of Kilmurry. There is the possibility that John enjoyed his occupation as a confectioner a little too much and would sample his own sweets as by 1863 he had a set of dentures, made entirely of silver. There was an intriguing court record regarding John and these silver teeth. On 11 July 1863 Mary Shaughnessy (29) was imprisoned for 3 months for stealing John F. Goggin’s silver teeth, this was her 25th conviction. Mary gave the teeth to twelve year old Margaret Grady, who knowingly handled stolen goods. Margaret was sentenced 14 days imprisonment before spending 5 years in St. Joseph’s Reformatory School in Dublin. In January of that year his daughter Julia had taken a silk dress into Anne Carmody of Market Alley to be altered, but Carmody did not return the dress. This lead to them going to court, where Anne was was ordered to pay Julia compensation and costs or face a month in prison. Sodium hydroxide was immediately applied to the wound, which was located on the joints last two fingers of his right hand, to burn away the damaged flesh. The wound remained open but uninfected for a number of days before John Goggin began to feel unwell. This was brought to the attention of the leading doctors in Limerick at the time though no remedy could aid John and he took a turn for the worse and he died at his home on 29 George Street. It is probable that he died of hydrophobia (rabies) as the monkey after killing both the family dog and cat was deemed infected with the disease. He was buried in St. John’s Church of Ireland Churchyard his age was recorded as 52 (though this would put his age at marriage as 12). 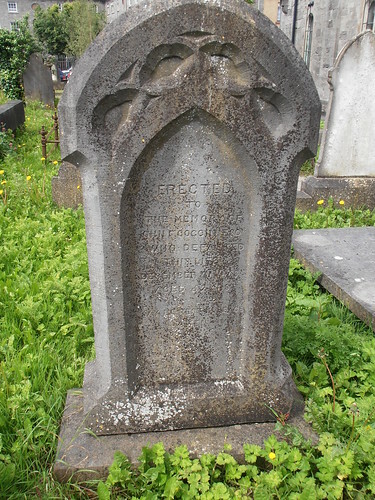 John’s wife, Catherine, aged about 69, died 3 weeks later on 10 January 1864 and was also buried there. His son-in-law Patrick Coffee was the executor of his will and as his next of kin, John’s daughter Julia, received his estate worth under £300 on 19 February 1864. There is a possibility that although John Goggin was of the Church of Ireland faith his wife Catherine may have belonged to the Roman Catholic church as she would later be interred separately from her husband in Mount Saint Lawrence Cemetery which was predominately Roman Catholic burial ground. Also their daughter Julia was married in a Roman Catholic cathedral.